The UK is a world leader in contactless payments. The widespread adoption of contactless in the UK was a gradual process but over the past few years contactless use has grown exponentially. In just a decade, contactless cards have gone from a niche offering to becoming the first choice payment in all kinds of situations. Consumers have embraced the speed and convenience of contactless payments, with many using it as the preferred way to pay for everything from commuting to grocery shopping, for purchases up to £30. Between January and June 2017, £23.23 billion was spent using contactless. This is close to the total for 2016, when £25 billion was spent using contactless cards. This, in turn, is more than double the spending in the previous eight years combined (£11 billion). 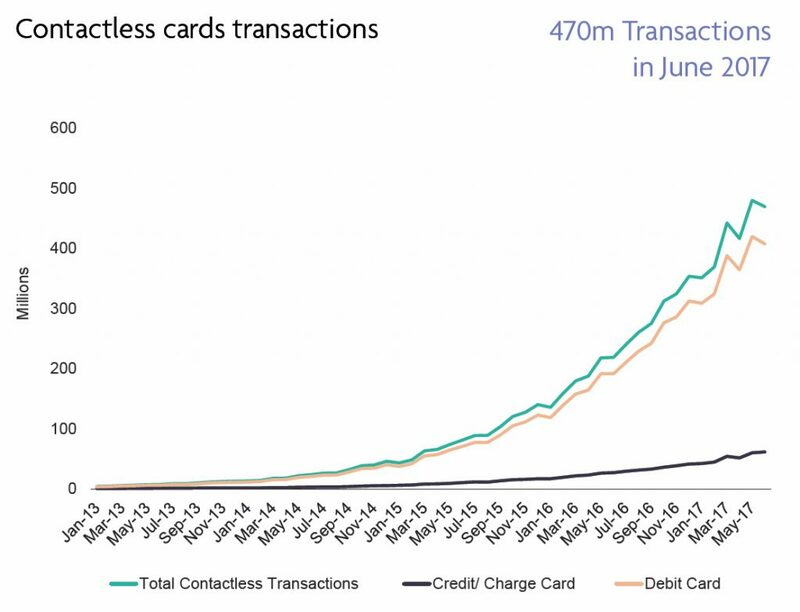 The number of contactless cards stands at 111 million. This breaks down to 74 million debit cards and 37 million credit cards. 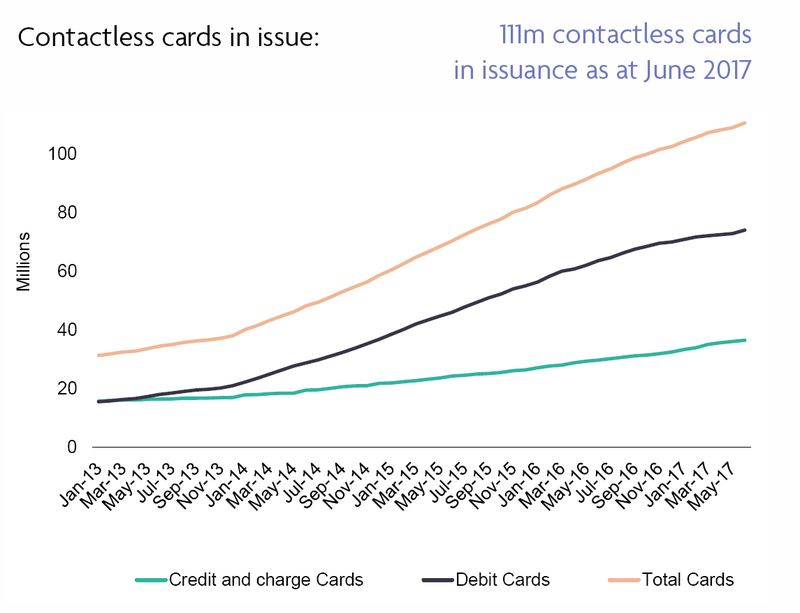 The number of terminals accepting contactless cards has also grown rapidly in recent years. As of June 2017 there were 500,000 acquirer-owned terminals. In 2016 food and drink retailers such as supermarkets and off-licences were the most popular place for contactless use, accounting for 43% of all contactless purchases with an average transaction value (ATV) of £9.70. 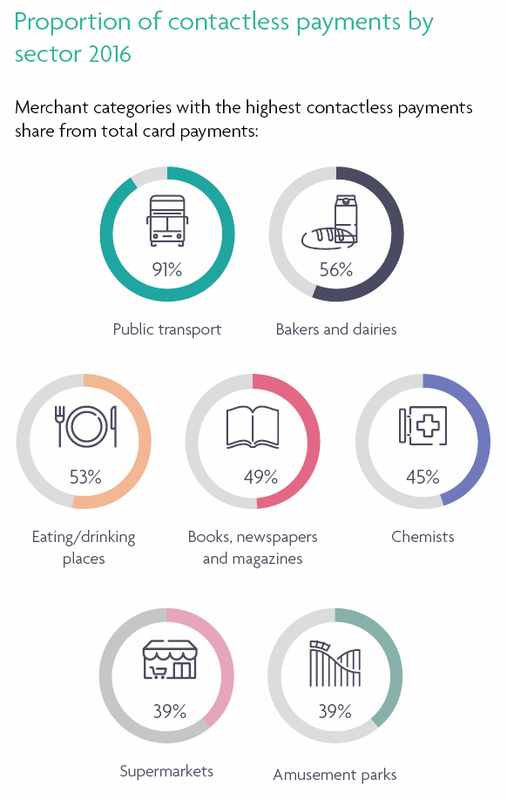 This is mainly driven by extensive contactless acceptance at most British supermarkets, where 91% of food and drink contactless purchases were made. The second most popular sector for contactless payments was in the entertainment sector, representing 28% of contactless purchases by volume, with an ATV of £7.99. Most contactless activity in this sector was in restaurants, fast food establishments, pubs and coffee shops, which accounted for 89% of all contactless payments. In the ‘other retail’ sector, chemists, book stores, newsagents and gift shops were the most popular locations, in part driven by growing demand from consumers. “Contactless payments have completely transformed how people pay for travel in London. We’ve now seen more than one billion journeys made using contactless payment cards and on average two million journeys are made every day,” comments Shashi Verma, Chief Technology Officer at Transport for London.